WASHINGTON (AP) — Call it gilt by association: The 2016 presidential hopefuls have become serial name-droppers, hoping to boost their own appeal by borrowing the luster of others. They’re sprinkling their speeches, interviews and tweets with mentions of everyone from the old standby, Ronald Reagan, to civil rights leader Martin Luther King Jr., rapper Nicki Minaj and astronomer Galileo. There’s a flip side, too: Republicans tossing out the names of Democratic foils to rile up the GOP faithful (and gin up campaign contributions). BY: Wisconsin Gov. Scott Walker, Kentucky Sen. Rand Paul, Texas Sen. Ted Cruz and many others in the potential GOP field. QUOTE: “I often joke that I know Ronald Reagan’s birthday because it’s my wedding anniversary. But truth be told, Tonette would tell you, I know our wedding anniversary because it’s Ronald Reagan’s birthday.” — Walker, with a reference to his wife. WHY: Reagan is a hero to the Republican faithful. No GOP candidate can go wrong by cozying up to the Gipper, who is admired by Republicans both for his love of tax cuts and his tough-guy foreign policy stance. BY: Jeb Bush, former Florida governor. WHY: Republicans revere Lincoln as the party’s first president and for his principled leadership. Bush, regarded with suspicion by some conservatives who think he’s too moderate, is out to paint himself with the same broad brush as the 16th president, who held the country together in dire times. BY: Sen. Marco Rubio, R-Fla.
NAME DROPPED: Martin Luther King Jr.
WHY: Paul invokes the civil rights leader as part of his call to address economic and racial inequality. He’s trying to appeal to a more inclusive swath of voters than the typical GOP coalition. BY: Louisiana Gov. Bobby Jindal. WHY: Jindal tried to polish his conservative credentials by lining up with the “Duck Dynasty” patriarch, who faced a backlash after he spoke out against homosexuality. 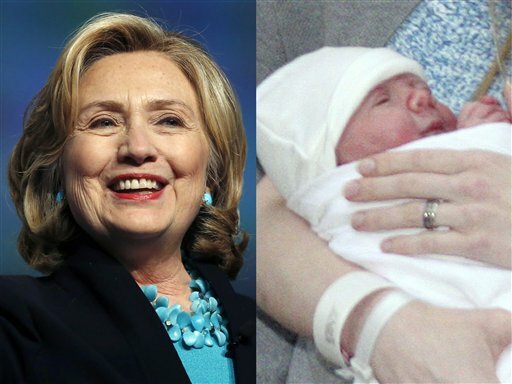 NAME DROPPED: Charlotte Clinton Mezvinsky, 7 months old. BY: Her grandmother, Hillary Rodham Clinton. WHY: Clinton is framing her message of fighting for the middle class in a more approachable context in her second presidential bid. What better way than through the lens of a grandmother wanting the best for her new granddaughter? NAMES DROPPED: President Barack Obama, Hillary Clinton, Obamacare, the Internal Revenue Service. BY: New Jersey Gov. Chris Christie, Paul, Walker, Cruz and other Republicans. “All he cares now is about his legacy and his library — the two L’s. The two L’s for Barack Obama is all that’s left — legacy and library.” — Christie. “The difference between President Obama and myself, he seems to think you can negotiate from a position of weakness.” — Paul. “People like Hillary Clinton seem to think you measure success in government by how many people are dependent on the government.” — Walker. “Over and over again, when we face impossible odds, the American people rose to the challenge. You know, compared to that, repealing Obamacare and abolishing the IRS ain’t all that tough.” — Cruz. WHY: Republicans can rouse an audience — and attract campaign contributions — by tossing out references to bogeymen like Obama, Clinton, the IRS and the president’s health care law. Tags: 2016 presidential candidates, Hillary Clinton, name-dropping, washington. Bookmark the permalink.